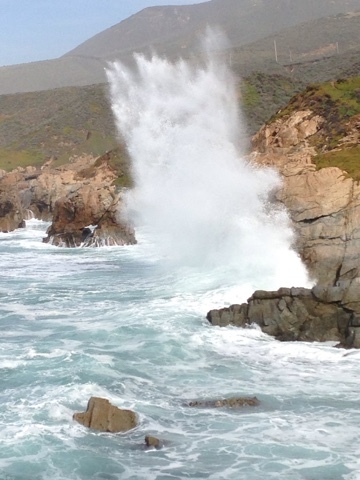 While in Monterey, CA I was treated with higher than normal surf due to full moon and storms. They refer to them as "Kibg "Tides"
It made for great surf watching as in the crashing wave above at Big Sur south of Monterey. 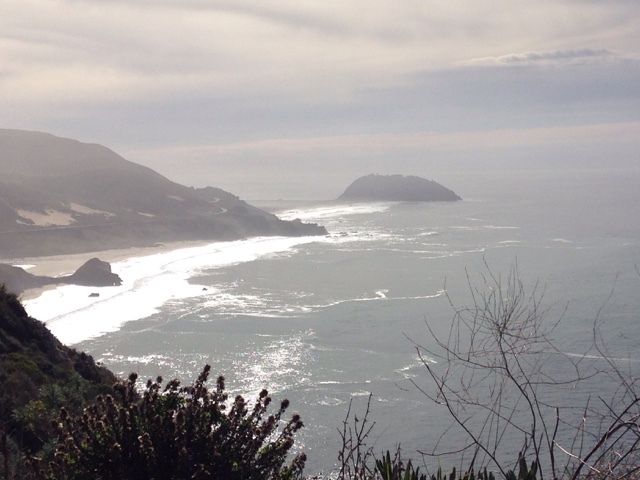 To enhance the ocean viewing is the spectacular coastline. This rocky section of coast at Big Sur is in contrast to the fine sandy beaches and high sand dunes in Monterey Bay and then the mini marble rock beaches called Pebble Beach on the Monterey Peninsula. 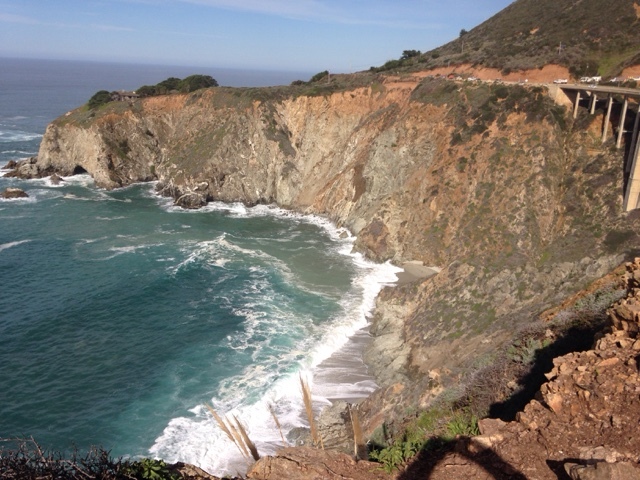 This small bay on the Big Sur Coast is famous as the Bixby Bridge passes over the canyon below. 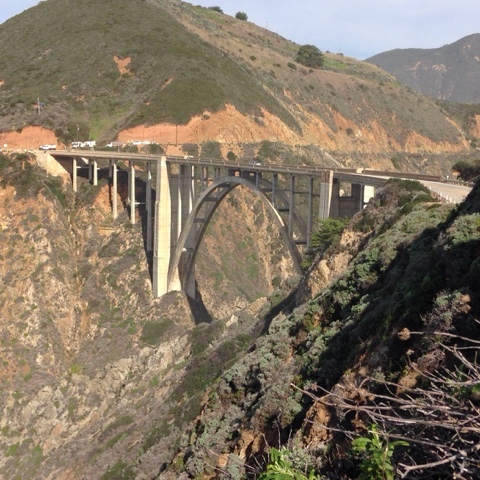 Here is the Bixby Bridge that is known for being picturesque, and by a small group base jumping enthusiasts a great place to leap off. A woman and a man jumped off while I've been here and are presumed dead from drowning. Days after their apparent jump someone reported equipment on the beach below (two pictures above). It was the camera that one was wearing that is helping the investigators determine what might have happened, but high surf is believed to have played a role. Read how they believe it all happened. This picture was taken at the same time as the others but looks different due to the angle of the sun and perpetual haze from the ocean. 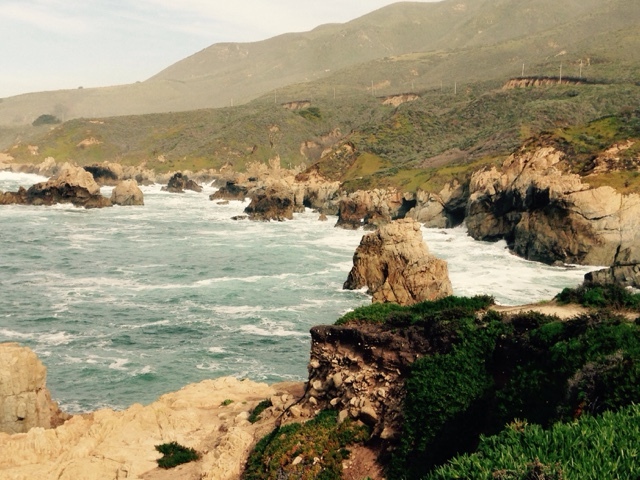 Along the coast of Big Sur are cliffs, rocks and beaches inbetween. There are many places to stop and walk out to take photographs and other places where you can get to the secluded beaches. It's one of those places that you don't want to miss on your cross country trip.